The Northrop/McDonnell Douglas YF-23 was a prototype fighter aircraft designed for the United States Air Force. The YF-23 was a finalist in the U.S. Air Force's Advanced Tactical Fighter competition. Two YF-23s were built and were nicknamed "Black Widow II" and "Gray Ghost", respectively. The YF-23 lost the contest to the Lockheed YF-22, which entered production as the Lockheed Martin F-22 Raptor. 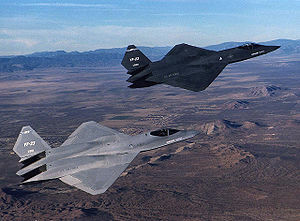 The YF-22 and YF-23 were competing in the USAF's Advanced Tactical Fighter (ATF) program, conceived in the early 1980s, to provide a replacement for the F-15 Eagle. Contracts for the two most promising designs were awarded in 1986. The YF-23 was designed to meet USAF requirements for survivability, supersonic cruise (supercruise), stealth, and ease of maintenance. Designed with all-aspect stealth as a high priority, Northrop drew on the company's experience with the B-2 Spirit and F/A-18 Hornet. The YF-23 was an unconventional-looking aircraft with trapezoidal wings, substantial area-ruling, and a V-tail. Similar to the B-2, the exhaust from the YF-23's engines flows through troughs lined with heat ablating tiles, which shields the exhaust from infrared (IR) missile detection from below. The vehicle management system coordinates movements of the control surfaces for maneuvers and for stable flight, along with other aircraft functions. The wing flaps and ailerons deflect inversely on either side to provide roll. Pitch was provided by movement of both V-tails, and yaw was supplied by opposite movement. Deflecting the wing flaps down and ailerons up on both sides simultaneously provided for aerodynamic braking. The black YF-23 (PAV-1) was nicknamed "Black Widow II", after the Northrop P-61 Black Widow of World War II and had a red hourglass marking resembling the underbelly marking of the black widow spider. The black widow marking was briefly seen under PAV-1 before being removed at the insistence of Northrop management. The gray colored YF-23 (PAV-2) was nicknamed "Gray Ghost". Both YF-23s were furnished in the configuration specified before the requirement for thrust reversing was dropped. The weapons bay was configured for weapons launch but no missiles were fired, unlike Lockheed's demonstration aircraft. The YF-23s flew 50 times for a total of 65.2 hours. The first YF-23 with P&W engines supercruised at Mach 1.43 on 18 September 1990 and the second YF-23 with GE engines reached Mach 1.6 on 29 November 1990. For comparison, the YF-22 achieved Mach 1.58 in supercruise. The flight testing demonstrated Northrop's predicted performance values for the YF-23. The YF-22 won the competition in April 1991. The YF-23 design was more stealthy and faster, but the YF-22 was more agile. It has been speculated in the aviation press that the YF-22 was also seen as more adaptable to the Navy's Navalized Advanced Tactical Fighter (NATF), though as it turned out the US Navy abandoned NATF a few months later. After losing the competition, both YF-23s were transferred to NASA's Dryden Flight Research Center, at Edwards AFB, California without the engines. NASA planned to use one of the aircraft to study strain gauge loads calibration techniques, but this did not occur. In late 2004, Northrop Grumman proposed a YF-23 based design for the USAF's interim bomber requirement, a role for which the FB-22 and B-1R are also competing. Aircraft PAV-2 was modified by Northrop as a full size model of its proposed interim bomber. The interim bomber requirement has since been canceled in favor of a more long-term, bomber replacement requirement. The same YF-23-derived design could possibly be adapted to fulfill this role as well. However, it appears the possibility of a YF-23-based interim bomber was ended with the 2006 Quadrennial Defense Review, in lieu of a long range bomber with a much greater range. Both airframes remained in storage until mid-1996, when the aircraft were transferred to museums. YF-23A PAV-1 (s/n 87-0800) is now on display at the National Museum of the United States Air Force in Dayton, Ohio. The aircraft was recently put on display following restoration and is located in the Museum's Research and Development hangar. Aircraft PAV-2 (s/n 87-0801) was on exhibit at the Western Museum of Flight in Hawthorne, California. In 2004, it was loaned to Northrop Grumman and used for display purposes. Eventually, the aircraft will return to the museum's new location at Torrance Airport, Torrance, CA. Note some specifications are estimated. Goodall, James C. "The Lockheed YF-22 and Northrop YF-23 Advanced Tactical Fighters". America's Stealth Fighters and Bombers, B-2, F-117, YF-22, and YF-23. St. Paul, Minnesota: MBI Publishing Company, 1992. ISBN 0-87938-609-6. Pace, Steve. F-22 Raptor. New York: McGraw-Hill, 1999. ISBN 0-07-134271-0. Sweetman, Bill. YF-22 and YF-23 Advanced Tactical Fighters. St. Paul, Minnesota: Motorbooks International Publishing, 1991. ISBN 0-87938-505-7. Winchester, Jim, ed. "Northrop/McDonnell Douglas YF-23." Concept Aircraft (The Aviation Factfile). Rochester, Kent, UK: Grange Books plc, 2005. ISBN 1-84013-809-2.